You can restore your WordPress Design site to an earlier version, which is useful if you ever accidentally delete something. (Your site is automatically backed up every 24 hours, and those backups are kept for 30 days. Note: If you cannot access your WordPress Design account, perhaps because of a payment issue, contact Support using the phone number at the top right of this page or click the chat button at the bottom. C3 can get in to a customer's Gateway through the site's WordPress admin panel (more info). 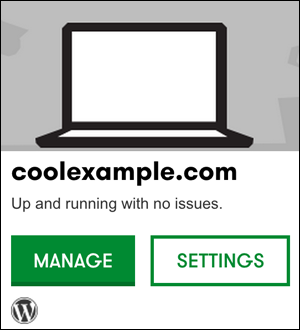 Click Settings for the WordPress Design website you want to restore. Pick a date and the backup type, then click Restore. If you have questions, you can speak with a PWS Specialist by calling (480) 463-8344.